This Catholic devotional bracelet features a Miraculous Medal which honors Our Lady of Grace. Our Blessed mother is always associated with roses and the medal has a rose on either side. The medal is comprised of antiqued sterling silver. This medal was hand cast in a mold made from a vintage medal. Then is was antiqued. The result is a new sterling silver medal that appears to be a vintage medal. The bracelet is a slider bracelet and is made from silver colored metal and is designed to fit all wrists. 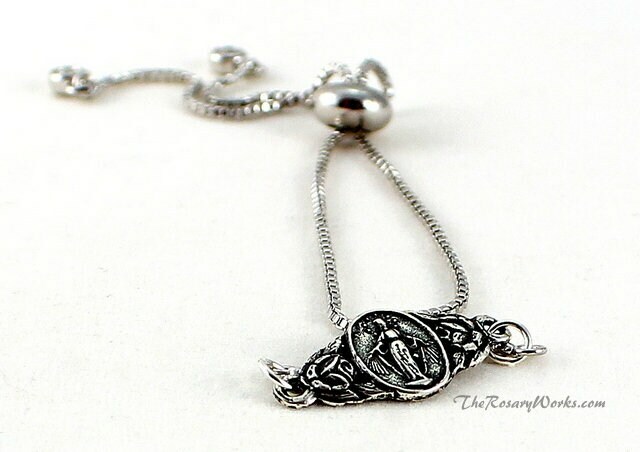 To put it on, you simply slide the large silver colored bead to the ends of the chains, gently slide it over your wrist and then you slide the large bead toward your wrist until it fits the way you want to. The ends of the bracelet have cubic zircons on them which add a little sparkle to the bracelet. Note: The prop used to display the bracelet in photo number 5 is much smaller than a human wrist. It is only 4 1/2 inches in diameter. The medal will look much smaller on a human wrist. The black velvet prop used in photo number 6 is 8 inches around and more accurately depicts what the bracelet might look like on your wrist.